Local taco shop, Tu Taco Taco Shop, features the Flamin' Hot Burrito which is a quesadilla layered with Xxtra Flamin' Hot Cheetos then wrapped around a California Burrito. "I'm building an empire," 23-year-old Victor Osuna told me during a recent visit. 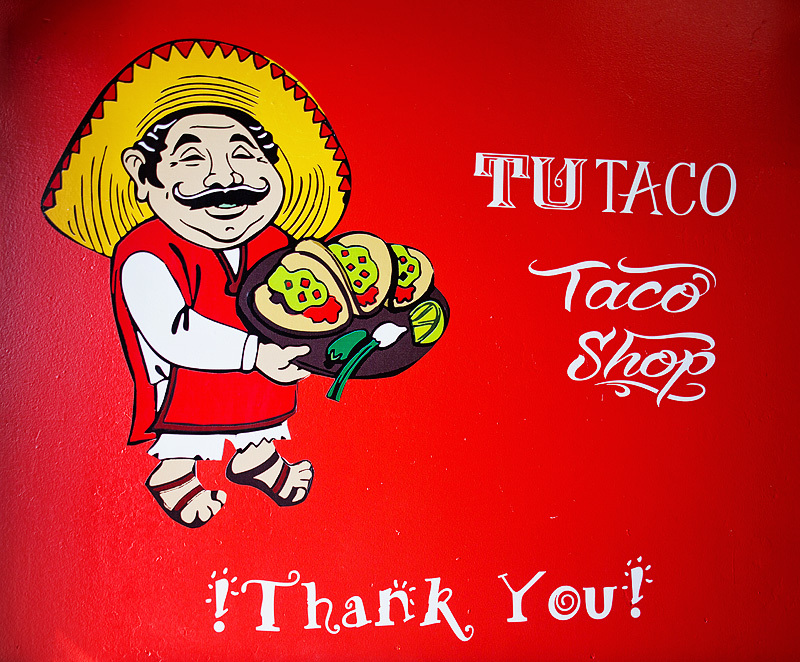 The owner and driving force behind Tu Taco Taco Shop in Chula Vista, just blocks from Hilltop High, grew up in the business – his mother owned two taco shops which are currently run by his uncle and brother. Though Victor never performed the duty of cook, he did practically ever other job in his mother's eateries. 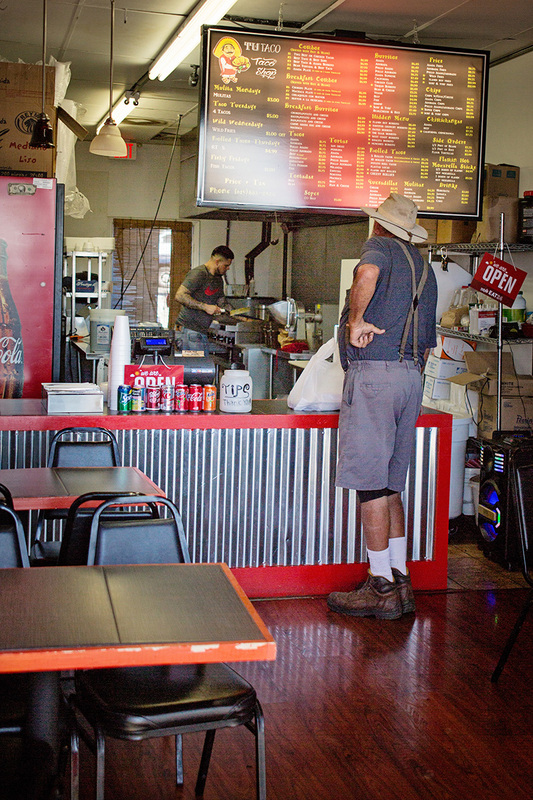 "I didn't start cooking until I decided to open this shop," said Osuna. Osuna's turning point from helper to owner came when he became a father. "I have two daughters," he told me. "I want to make something here. See it grow and, eventually, open a second location. This one will go to my oldest daughter; the next one will be for my other daughter. That way they each can have something I built for them." On the Saturday afternoon I visited, Victor was manning the open kitchen with a young cashier running the front. In between cooking, I asked him if he was usually the one at the grill top. Tu Taco Taco Shop owner, Victor Osuna, mans the grill top while finishing up a customer order. "Well, yeah," he started, "I don't just run the show. I am the show." With passion and pride he added that he can do every task it takes to run his business, from ordering, to register, to hooking up and maintaining equipment as well as dreaming up all of the menu items. "I like to experiment," said Osuna. "I put different ingredients together and if it tastes good and it's different, then I put it on the menu." 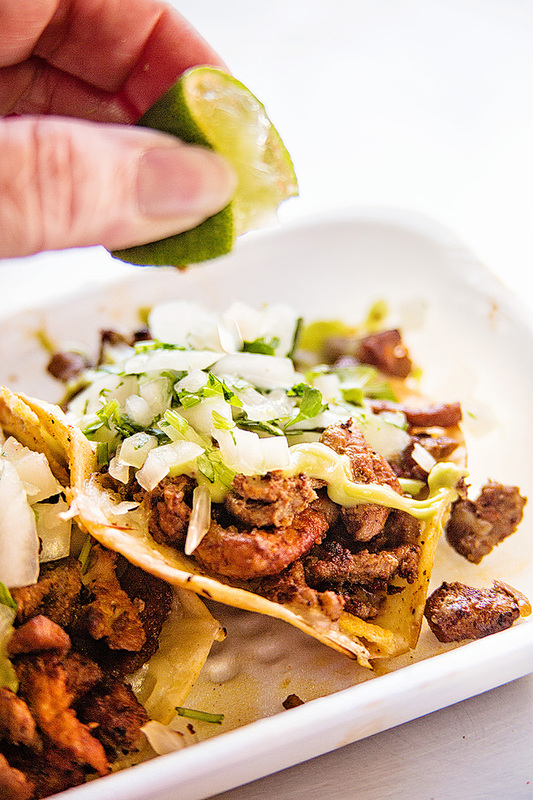 Yes, you will find the typical tacos here like asada, chicken and rolled tacos. But expect to find menu items that you'll probably need to ask for descriptions because their name might not give you any hints, especially if they reside on his "hidden menu." 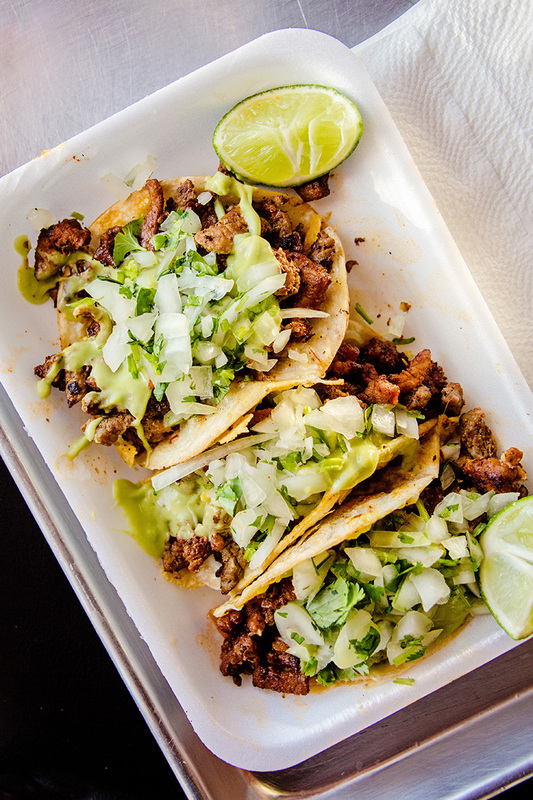 For example, I ordered "Tacos Perron," street sized tacos that were a sweet and savory combination of carne asada and adobada. The shell was a crispy flour tortilla that somehow escaped disintegrating with that first bite. Usually not a fan of fried flour tortilla tacos, I was pleasantly surprised at how perfectly the flour tortilla married with the two meats. The adobada itself was one of the best I've had. As a self-taught cook, Victor beamed when I mentioned this to him. Asked what his favorite menu item was, Victor said his most popular, the “Flamin' Hot Burrito." The Flamin' Hot Burrito is one of several items off of Osuna’s Flamin’ Hot menu, dishes with a hefty addition of XXtra Flamin’ Hot Crunchy Cheetos. 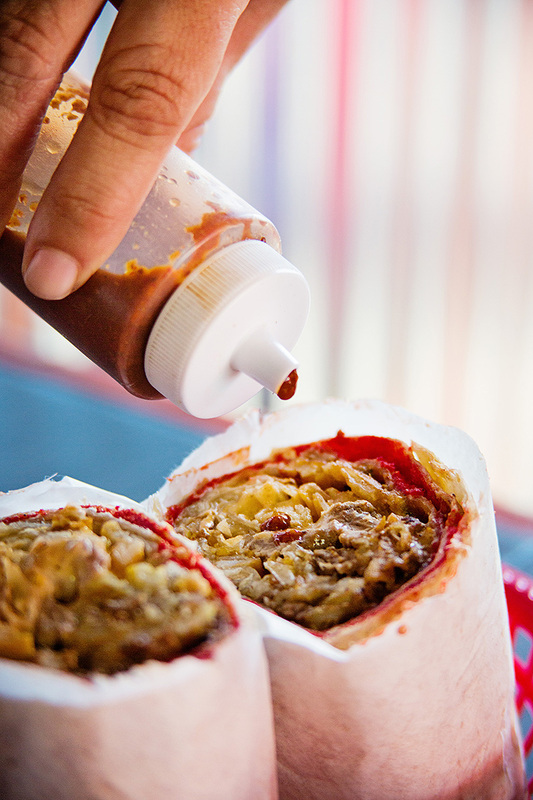 This particular burrito is one of Tu Taco Taco Shop’s most popular items and a particular point of pride for Osuna. He made the burrito one day while experimenting in the kitchen. An employee give it a try and suggested it needed to be on the menu. First, a quesadilla is grilled. Once melted, the quesadilla is pulled open and a healthy layer of Flamin’ Hot Cheetos that have been pulverized into a a fine powder is spread out over the tortilla. 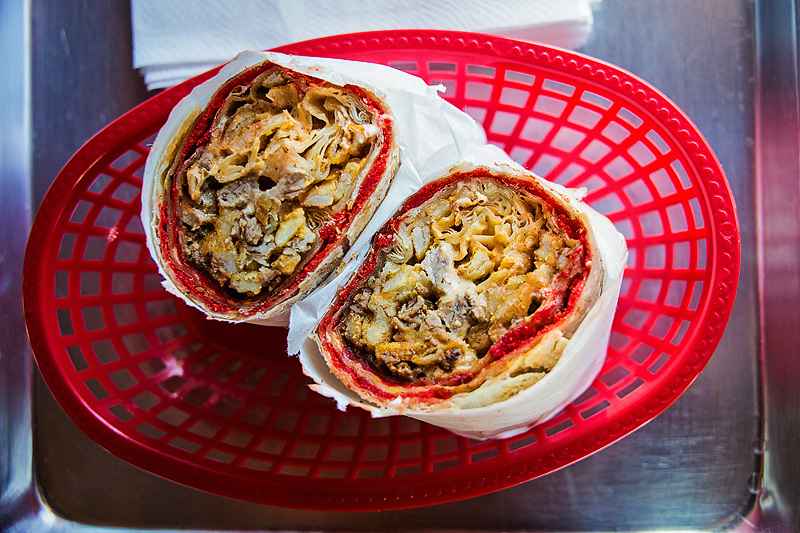 Then it is wrapped around what is basically a California Burrito bursting with carne asada and fries. By the name of it, and knowing what a heat wimp I am, I knew it would be much too spicy for me. My sister Ellie, however, who was my dining partner on this visit and is a far more adventurous eater than I, jumped at the chance to try it. My sister said it had tons of flavor and though a little spicy, not overwhelmingly so. Commenting on it’s generous size, however, she said it was a meal for two and wound up having to take half of it home. One of the things I love most about being a part of the San Diego food community is discovering small independent restaurants like Tu Taco Taco Shop and having the opportunity to share them with others. 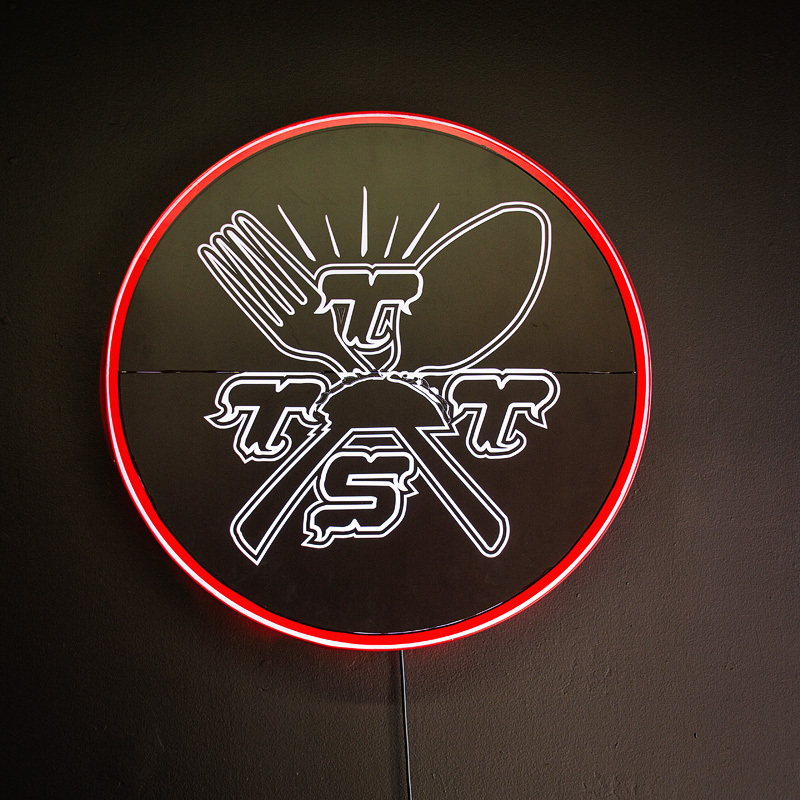 I would recommend this shop, not just for the food but for the passion behind this business. I do ask that you have patience, though. Food doesn’t always come quickly from the kitchen but that has more to do with the complexity of some of the items – his Flamin’ Hot Burrito, for example, is made in several stages so it takes some time to build – than it is a commentary on the quality of service. If anything, it’s a testament to it.